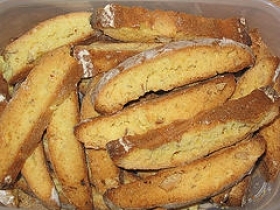 Have you made Biscotti Di Prato ( Tuscan Almond Biscotti)? 1. 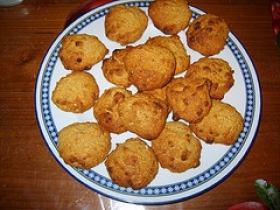 In the bowl of an electric mixer fitted with the paddle attachment blend the flour, the sugar, the baking powder, and the salt until the mixture is combined well. 2. 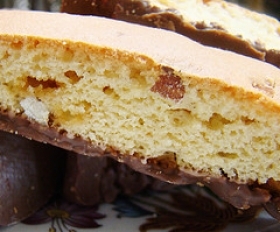 In a small bowl, whisk together the whole eggs, the yolks, the vanilla and the almond extract, add the mixture to the flour mixture, beating until a dough is formed, and stir in the almonds. 3. 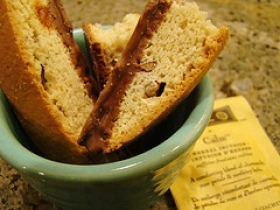 Turn the dough out onto a lightly floured surface, knead it several times, and divide it into fourths. 4. Working on 2 large buttered and floured baking sheets, with floured hands form each piece of dough into a flattish log 11 inches long and 2 inches wide, arrange the logs at least 3 inches apart on the sheets, and brush them with the egg wash.
5. 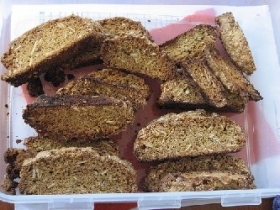 Bake the logs in a preheated 350F oven for 35 minutes and let them cool on the baking sheets on racks for 10 minutes. 6. 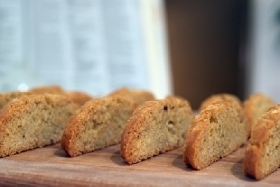 On a cutting board, cut the logs crosswise on the diagonal into 3/4" inch slices, arrange them the biscotti, cut sides down, on the baking sheets, and bake them in the 350F oven for 5 to 7 minutes on each side, or until they are pale golden. 7. 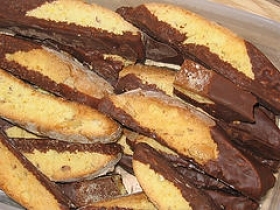 Transfer the biscotti to racks to cool and store them in airtight containers.